The trainer team of Knowllence provides for many years training on FMEA Methods (AIAG, VDA, Design, Process). Reverse FMEA is a recent approach to lead your FMEA studies in the plant, as close as possible to the manufacturing process. What is a Reverse PFMEA regarding a FMEA and a solving problems tool? How to implement a Reverse FMEA? Be more proactive in your PFMEA review. Recommanded time : 1 day on your site, with a maximum of 8 participants. Failures: quick reminder of what a failure is, prevention and detection. Position of FMEA and solving problem tools. Process FMEA (PFMEA): concept and method. Review your Process FMEA, implement a REVERSE Process FMEA. How Reverse Process FMEA can help you be more proactive? 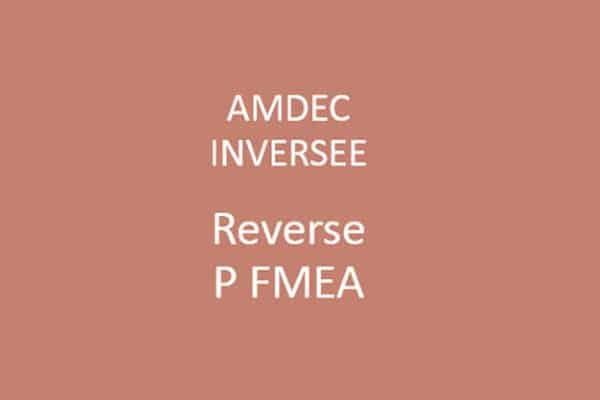 Reverse PFMEA: definition and purpose, benefits. Train the team, prepare the inputs: customize your check list. This training can be conducted in English or in French. You just have to precise the language you choose when ordering the training session. Our trainers on the subject of Reverse FMEA are always experimented engineers, with a strong industrial or automotive knowledge. They also train to Design and Process FMEA (AIAG or VDA), and to our FMEA software.